Jake is an outdoorsman. An avid hunter, he has many favorite locations for hunting. He also works outdoors on a local farm. We specialize in location photography, spending time with each senior to capture images in settings that are meaningful to the senior and his family. 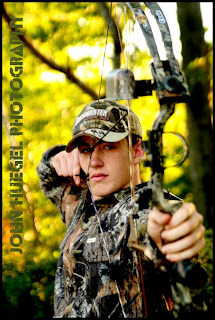 One of Jake’s chosen settings for his senior portraits was this outdoor shot of his bow and hunting gear. Using a telephoto lens to tighten the depth of focus to his face, I shot this one into some backlit leaves. I am just glad Jake didn’t have an arrow in that bow – I was point blank in front of him for several shots! Jake is an outdoorsman. 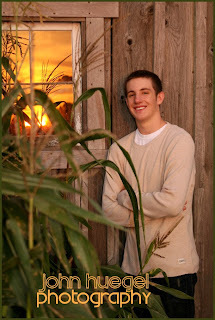 Hunter, fisher and Eagle Scout, his work and his interests take him outdoors. So we spent much of the evening outside in McKean Township, capturing some great images. Here’s a shot taken at sunset. You can see the reflection of the sun in the barn window. Thanks Jake. You’ll see more images soon!